It's the middle of February, and you know what that means: it's cold all the way to your bones. Even though I live in the great state of Colorado, which boasts a pretty temperate climate and records far more sunshine each winter than any other city in which I've ever lived, I've still had to force myself out from under many layers of cozy blankets and pry myself away from the nest of pillows that keeps me warm every night. I've also had a parade of illnesses and have been taking so much cold medicine that I haven't even been reading. (WhAt?? I know, it shocks me a little, too.) This is why there's been a posting delay. In better news, I intended to post on Friday afternoon as usual - but I then I started reading a new book and I knew I had to finish it first and share it with all of you, so I delayed, thinking I would definitely finish it by Saturday. And then I DID finish it Saturday night, but stayed up so late finishing it that I slept in FAAAAAAAR too long on Sunday, and then spent the rest of the day trying to make up for my slothfulness instead of writing this blog post. So here we are. I have books to share, the Olympics are over so I can stop pretending that I like them as much as I love the Summer Olympics, I polished off all of the episodes of "Eureka," and my cold appears to be on the run. It's a fresh start, smack in the middle of winter. A little off-schedule, but ten minutes late is my brand, as anyone who knows me can tell you, so it's all good. Now listen up, because I have a couple of great books for you! Worth the wait, I promise. Valeria Luiselli’s brief book about the undocumented children of Latin America who have been streaming towards the United States since 2014 is an excellent primer on the ways in which the children of Honduras, Colombia, and El Salvador have been forced into the most desperate of situations that Luiselli persuasively describes as part of a transnational war in which the intersecting marketplaces for drugs, guns, and gangs have created a trail of murder and persecution that stretches from the Southern most borders of Honduras all the way to the northeast corner of the USA. Luiselli writes tersely about the horrors these hundreds of thousands of unaccompanied minors suffer prior to their arrival in the US - as well as the terrible circumstances they face when they (almost universally) turn themselves willingly over to the US Border Patrol and ICE. Thanks to at least a decade of punishing and biased legislation and policy under presidents of both parties, the kids who risk their lives to arrive here - after fleeing gang violence, sexual and physical assaults, homelessness, broken families, lack of schooling, and so much more in their home communities - hoping to reunite with parents or other relatives face terrifying odds in successfully claiming special immigration or asylum status. Although I have long been a general critic of America’s approach to its relations with its southern neighbors, I knew next to nothing about recent immigration law. What Luiselli shares here following her own work as a translator for the minors at the center of the story was a revelation to me. The fact that she writes the bulk of her narrative in 2015, before the aggressions of the Trump era, leaves me completely shocked and additionally terrified for these kids who are caught in the deep net of policies, relationships, and compromises that are local, regional, and transnational and can be traced back to attitudes and actions taken decade before any of them were born. These children are refugees of war and turmoil. They deserve our protection, not our dismissal. Read this book and learn what is happening in our name, within our borders and far beyond them. I've noticed that right now, for whatever reason, I need to follow up any serious reads with something (sometimes several somethings) light and fast. Palate cleansers? Maybe, but it's not as though I'm in a total beach read/ chick lit sort of place: I still want to be enchanted and beguiled. I just don't want to add to my worry quotient. Anyway. The latest light read was Moxie by Jennifer Mathieu. I can't wait for my middle school daughter to finish the book she's reading now so that she can check this one out! Jennifer Mathieu's Moxie is the book I wish I had when I was in high school - but of course, that would be anachronistic, so makes no sense, but just roll with me here. Viv, the book's protagonist, lives in rural Texas, where sexism is still seen as the natural order and football rules the day. Quietly seething over the injustices, Viv becomes emboldened with a little assistance from her Gen-X mom, a former Riot Grrrl turned single parent healthcare worker, and her "My Misspent Youth" memory box. force, and that's a difficult concept to share. Written for a YA audience but bound to be loved by today's Gen X parents, too, Mathieu's Moxie is a must read for any kid ready to fight back, even if their voice is shaking. Fun and interesting read. Whoa. Scoot down to your local bookstore and get your hands on a copy of Tara Westover's memoir tout de suite, because this is a barnburner of a memoir and sure to dominate the best books lists of 2018. And for good damn reason! In measured and unflinching fashion, Westover shares the story of growing up as the youngest member of a family led by an antigovernment Mormon survivalist father. In the mountains of rural Idaho, she never attends school and also is not homeschooled; everything she learns, from reading to math and science, she does on her own, with very few resources aside from the Bible and the Book of Mormon. Instead, she learns how to live off the grid and without government assistance or modern medicine of any kind. With little fanfare, she describes her childhood as one of packing "go" bags, helping her mother create essential oils and act as midwife for others in their tiny community, and sifting through the detritus of her father's metal scrapyard. We watch alongside her as her father builds an impressive arsensal and buries thousands of gallons of gasoline in their field in preparation for Y2K. We hear the story, over and over, of how Randy Weaver and his family were murdered by the government for not sending their children to school and how easily it could have been them. We see Tara grow old enough to begin helping at the junkyard and at various construction sites in earnest, lugging scraps, clambering across roofs without harness or hard hat (it would slow them down, so her father forbade it), knocking together sheet metal, and so on. The work this child is required to perform takes your breath away - but that's barely the beginning. Eventually, assisted by one of her brothers, Tara decides to try and go to college. This is no big spoiler, since it's on the back cover and included in every blurb I've seen. But the sheer difficulties she faces in getting to college are heartbreaking, and once she arrives, the world is a completely exotic place to her (it reminded me so much of A Stone of Hope in this section). She not only earns a BA, but an MPhil and a PhD as well - from Cambridge, no less. This portion of the story is not as well developed as the earlier experiences, but that only makes sense, since Westover only finished her studies a few years ago. I'm sure I'm not alone in hoping that we hear a literary update from her in the years to come. I wonder how much more difficult the road will be for her, as she finds she must confront so much trauma and betrayal in order to heal. It won't be easy. But if there's ever a person willing to tackle the most daunting of tasks, it is Professor Westover. The real wonder of this work isn't that she has survived and even managed to thrive despite the catastrophes and hardships she experienced. It's that the book is written with such extraordinary nuance and skill. As it opens, you realize that her life is unusual, but she has a way of telling her story that beguiles you into thinking that it's not as horrible as you might think should you merely read a list of what she lived with - and without. And as she matures, so too (very slowly) does her awareness of the strangeness of her life. As her own blinders are removed, so too are the readers - and she does it in such a subtle, unsentimental fashion that it floored me time and again. Moreover, she manages to draw portraits of the portraits of the people responsible for her experiences with amazing grace and power. She neither makes apologies for them nor does she brand them as the abusive and sociopathic people they undoubtedly are, even as she tries to grapple with the harm they have inflicted on her identity, her outlook, her very life. And she manages to do all this within the mental framework of someone who didn't experience any kind of organized learning until she wound up at BYU. Who had never written a journal or an essay; who had never taken notes. Someone who didn't grow up reading great authors - or any authors at all, really. It's just a remarkable achievement, and one I deeply admire. Westover's story is unforgettable. Her writing, unparalleled. Her book? Read by far too few thus far (but then again, it just dropped a week or so ago). Pick it up and you won't be able to put it down, I promise. 2. Boxwalla: I decided to try this subscription box out on a whim, in hopes of finding some new authors and publishers. I just received my first box and although I haven't read any of the books completely yet, a peek inside the covers revealed some really promising work! Give it a whirl! I just stumbled across this list because I read one of its recommendations this year (Moxie!). The organization pulls together a list of annotated new works for the 18 and under set that have "significant feminist content." Maybe it's because I'm really jonesing for spring, or maybe its because my kids are now officially too old to read Beatrix Potter and I feel a little nostalgic. I loved those little books so much - I checked at least a couple out at the library every week for years and years. Nothing like that perfect child sized book and its shiny white cover, the gentle illustrations and the utterly British stories, full of eccentric and sometimes truly naughty characters! 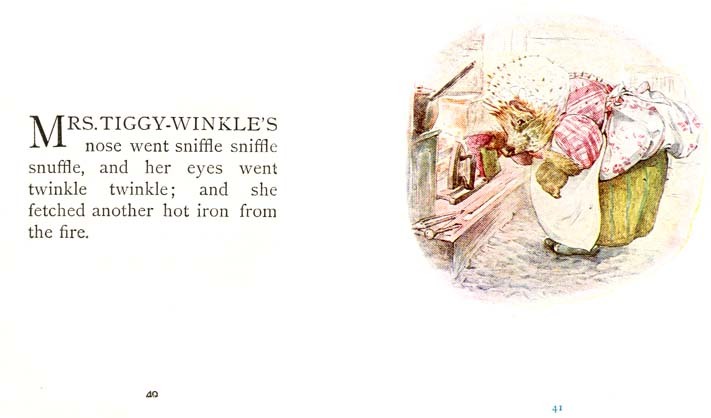 My favorites are Mrs. Tiggy-Winkle and Squirrel Nutkin. Who are yours? 5. And just under the wire, a few favorite reads in honor of Black History Month that you might not have heard of but are sure to enjoy: Sag Harbor by Colson Whitehead, Mules and Men by Zora Neale Hurston, Underground Airlines by Ben H. Winters, The Bluest Eye by Toni Morrison, Trouble in Mind: Black Southerners in the Age of Jim Crow by Leon Litwack, Everyday Africa: 30 Photographers Re-Picturing a Continent by Merrill et al., eds, and Akata Witch by Nnedi Okorafor. Share your favorite! Oh, heck. I don't know. Here's what I have read significant portions of in the last four days: The Hazel Wood by Melissa Albert, The Monk of Mokha by Dave Eggers, I Am, I Am, I Am by Maggie O'Farrell, and Swimming Lessons by Claire Fuller. What actually winds up making it to the finish line is a carefully kept secret...or just whatever my mood demands. If you're enjoying my blog, please share it with your favorite book-reading friends and neighbors. You can sign up for email notices when a new entry has been posted by clicking the "Subscribe" button at the top of the page, set your calendar to remind you to check in with me on Friday afternoons or Saturday mornings (I try to have this out the door by 4pm on Fridays so we can all start our weekends reading! ), or you stop by and like Friends of Bookbaggin' It on Facebook, if you're a social media sort. There you'll find my weekly blog updates as well as some fun links and the occasional musing. Hope to see you soon and thanks for reading!